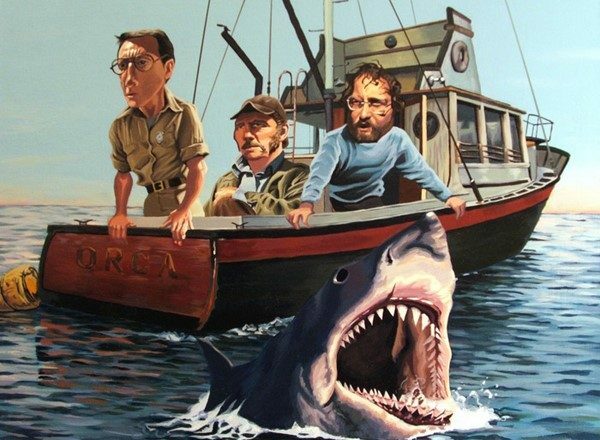 In case any readers were wondering, “JAWS” is my favorite modern film. Some day I will do the list that everyone else works up for their top ten, and depending on the day, “JAWS” will be either one or two on the list (because “The Adventures of Robin Hood” will have to fight for that spot as well). Five years ago, we saw “Jaws” at a screening on Sunset Blvd. at the Vista Theater. Mr. Gottlieb spoke for a couple of minutes before the movie and as the principle screenwriter for the film, we hung on every word. 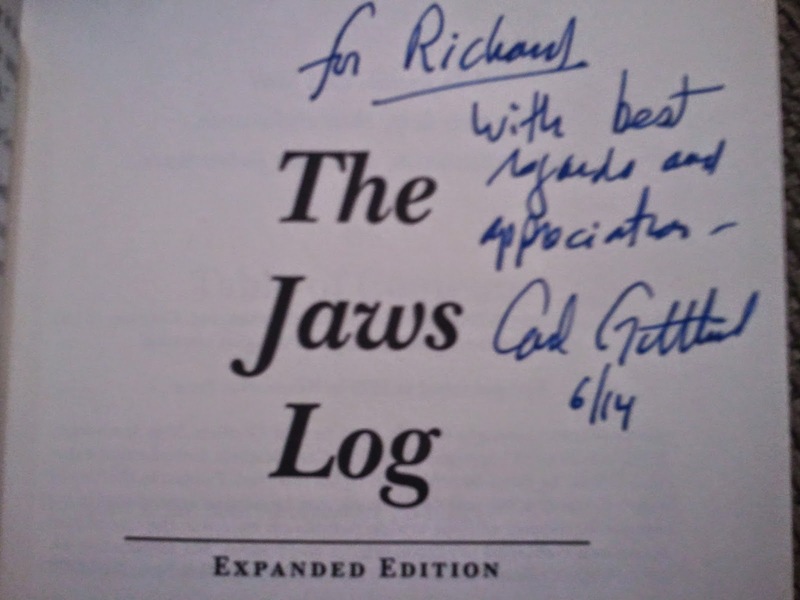 After the movie, my daughter (who is an even bigger “Jaws” fanatic than I am), had him sign her copy of “The Jaws Log”, the book he wrote about his experience working on the film (he also appeared on screen as the editor of the Amity Newspaper). I did not have the foresight to go out to the shed, dig through twenty boxes of books and locate my original paperback edition, so I missed out. 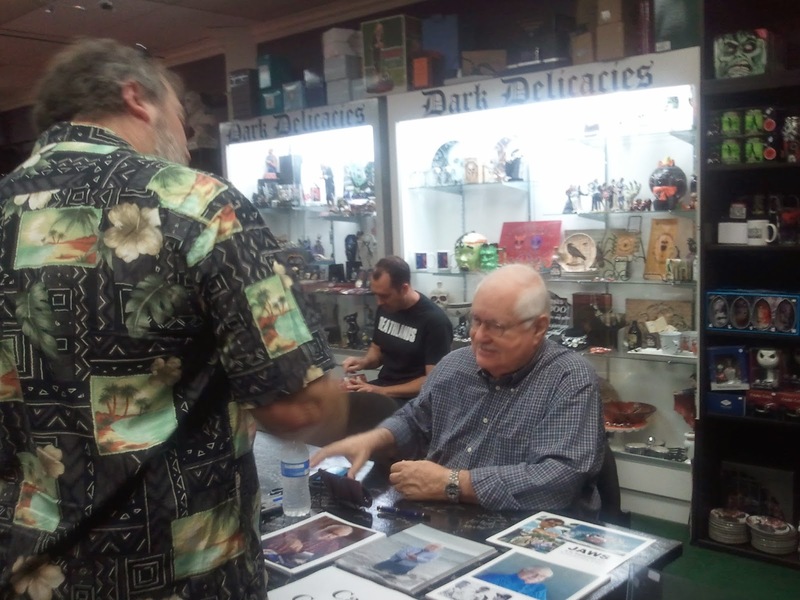 My blogging colleague at “It Rains, You Get Wet“, posted a notice that Carl Gottlieb would be at an authors signing at “Dark Delicacies” a horror themed bookstore in Burbank this Saturday. After making sure I had no other conflicts, I hijacked my kid the fanatic and off we went. I’ts been years since I was in this part of town but she recognized it right away, having recently visited a vintage store that sells movie and TV castoffs. It was not hard to find, the Gothic Lettering stands out on the street. I walked up, introduced myself and shook his hand. He smiled quietly and took my book and asked me the name I would like to have him sign it to. 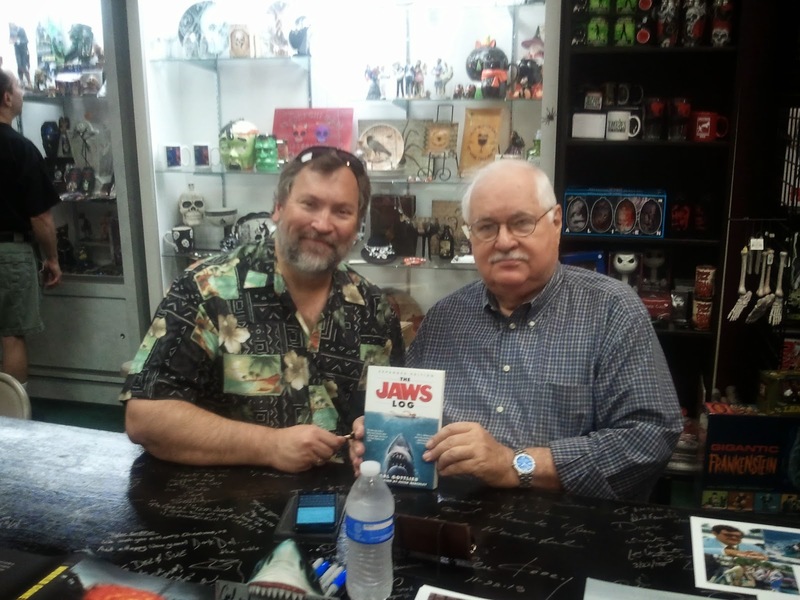 As he was looking for the title page to inscribe, I asked if it would be alright to get a picture with him. He said “of course” and invited me behind the table. This was only possible because the other authors had not yet arrived so there was room and not a big crowd to jockey through. I happily sat down next to him and watched as he wrote in my book. 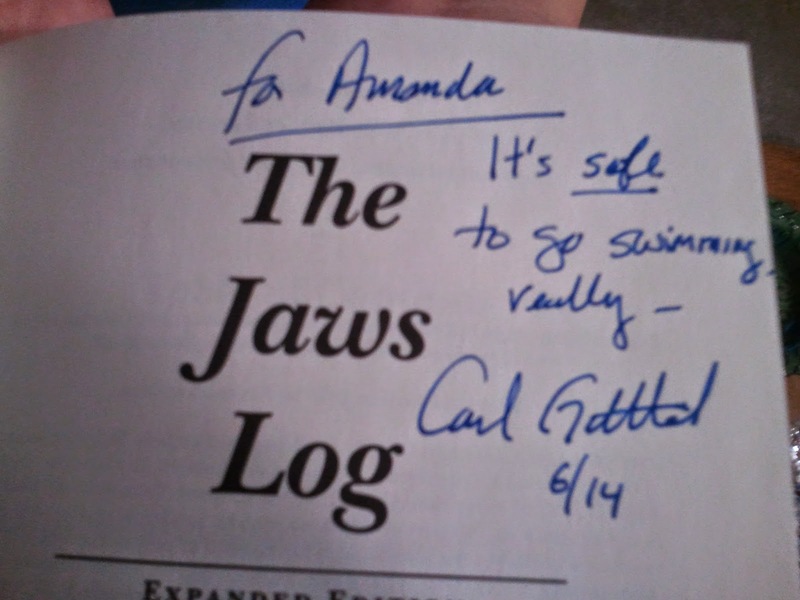 I’m happy to add this to my recently growing collection of signed books. Most of them have not been personalized like this one was so I will be able to appreciate this even more. I wish I knew the horror and gaming based books that were written by the other authors today. As people were coming in they were very impressed to meet their favorites. As I said, it looked like they were set up for a dozen writers or so. The bookstore was never overcrowded but it did start to fill in and I felt fortunate that we had gotten there when we did. Since my daughter accompanied me all the way across town to keep me from being alone, I consented to purchasing another copy for her to get signed. 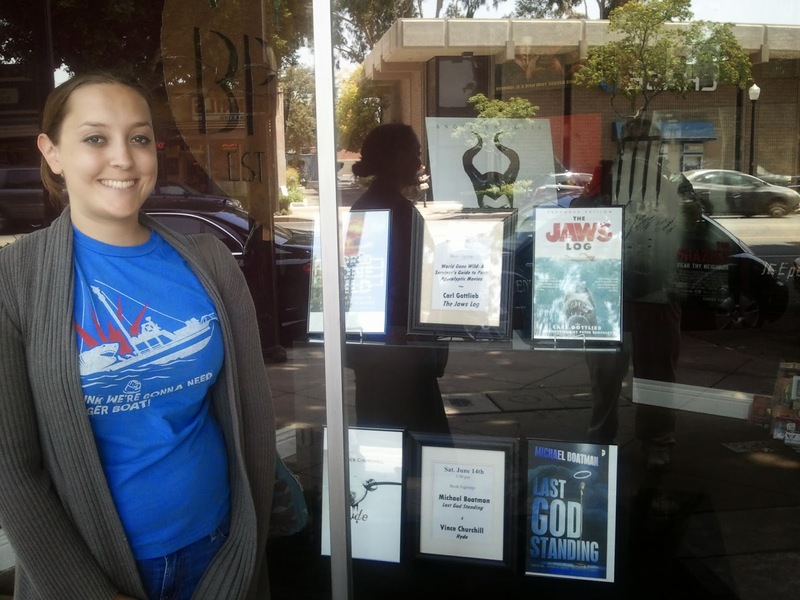 Short of going on ebay and hunting down collectibles at Christies, she is doing a good job of accumulating “Jaws” memorabilia. I tried to talk her into getting a souvenir key fob from the “Amity Island Motor Hotel” but she said she did not want anyone to think that she was just another of the summer ginks coming into town for the weekend. What can you say about a romantic couple that dies? (My apologies to Oliver Barret IV) Tragic love stories are the best, because everyone is suspicious of a happy ending, with tragedy no one worries about the future when the lovers are separated by death. That’s why Romeo and Juliet has lasted five centuries and “Say Anything” is mocked by the character in this movie. One of the “cancer perks” is that you will be forgiven for belittling other stories because yours is more tragic. You will also be forgiven because the story you tell has it’s heart in the right place. This is not a maudlin story or one about facing the incredible odds courageously. It is a story that feels real despite the obvious emo trappings that surround it. This is due in large part to the cast and the light touch of the director. They have processed what this book represents and translated it faithfully to the screen. Cancer patient support group does not sound like the typical “cute meet” in a romance. It sounds like something out of “Fight Club” without the cynicism. Whenever love manages to appear, even in the movies, if it is earned and reflects a legitimate path, then it is something you can respect. I respected this love story because the characters don’t fall in love instantly. One becomes enamoured of the other and then there is some real cat and mouse pursuit. That they are destined to fall in love is obvious going in to the story, but the story shows us why it happens instead of merely showing us that they are in love. Unusual circumstances bring them closer and they handle it in a way that seems reasonable for the situation. 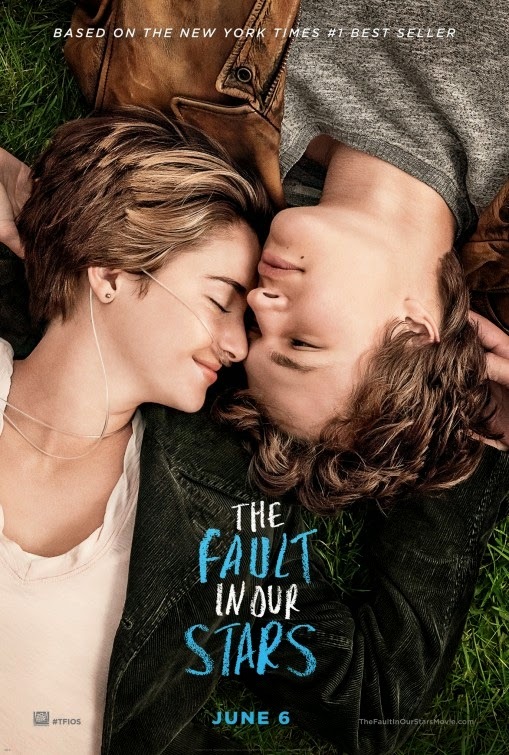 Shailene Woodley is perfectly cast as Hazel Grace, the central figure in the story. This is a tale told from the perspective of the girl. Even when the guys experience is driving the story, it is the female love interest that we follow through the plot. She is young and destined to not get much older. Her infirmities are such that the physical toll does not require her to fade in beauty as the movie goes on. Miss Woodley is a charming young woman with some nice screen charisma and she carries the story for the most part. Her counterpart is the weakness in the story, and not because the actor Ansel Elgort is not good. He is excellent at the clever by play and winsome smile and romance stuff. Where he falls down is with the dying cancer patient material. In the book (which I did indeed read), there is a physical transformation and a slow decay of the handsome and confident young man. He loses weight, and energy and looks sick according to the descriptions. In the film, he looks like the same guy we saw for the rest of the movie, only now he is in a wheelchair. It feels to be a little bit of a cheat that Hazel says in the prologue that this is the truth, not the sugarcoating, but in the end it is a little sugarcoated. There are some wonderful moments in the movie. I loved the dinner scene in Amsterdam. The hurling of eggs at Monica’s car worked pretty well on screen. I liked the cute script in the dialogue bubbles that represent the text messages. The visit to the Anne Frank house is also very good. Laura Dern as Hazel’s mom delivers some very strong lines about the hurt that she faces and the reality that they will go on. It did not sound like the platitude of a parent comforting a child, but the resignation of an adult to the hardest thing they will ever endure. Willem DeFoe looks more normal as the drunk writer than he usually does in his films, so it was played very realistically and for the most part. There were some appropriate cinematic changes to the end of the story and they improve on the clarity of the resolution without dragging in a search mystery at the last minute. Honestly, the only thing I missed from the book was the added resolution of Sisyphus the hamster. OK, I don’t have a lot to say about this today. Someday I will do an Indiana Jones Festival and invite anyone interested in participating. For now I will say I saw three movies in theaters this weekend, and if I had to choose only one to have gone to,this would have been it. Raiders is a fantastic adventure movie that continues to show how much better off we were creatively and as an audience, before Computers replaced everything we see with pixels. There is a lot of humor in Raiders and Harrison Ford never gets as much credit for these physical performances as he deserves. A slack jawed expression here, a scowl there and a smirk laughing at his own situation fill this character with more personality than most action stars get through a whole series of movies. I haven’t seen all of his recent performances, but I will be there on opening day to see Harrison Ford as part of the cast in “The Expendables III”. I think he will fit in fine if they give him some funny business to go along with the action stuff. If you haven’t seen my post on “Indian Jones and the Temple of Doom“, you don’t need to see Raiders first but it could not hurt. 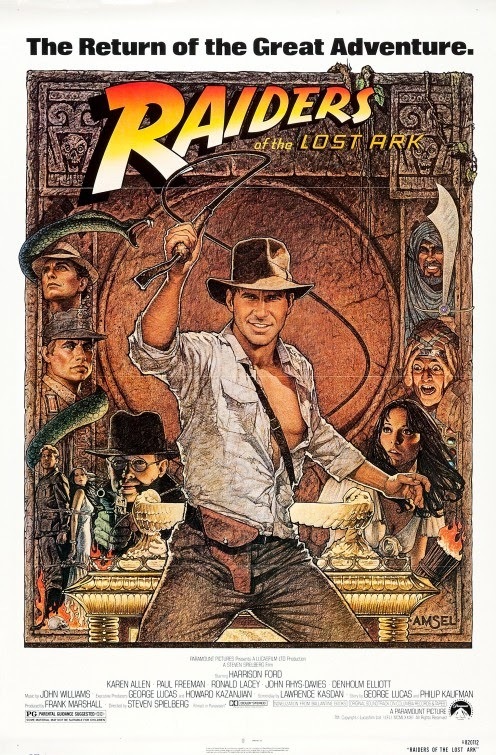 Anytime I encounter it, Raiders of the Lost Ark on the big screen it going to pull me back to 1936 for 115 minutes. That’s right my friends, this movie is less than two hours long and still packs more into it’s contents than films that add another hour to their running time. There is always something new in the background, foreground or dialogue that I haven’t focused on before but makes each experience unique. Today I was absorbed by all the little pieces of business that Ford does with his hands and face. AMC has done one thing with this current series that it failed to do with the last, lower the prices. These are movies that people will come out to see but $12 for a thirty-five year old movie on a Sunday afternoon was a little steep. They’ve dropped the price to $6, less than the cost of an early morning screening. Today, there were a dozen people in our showing. I may go again on Wednesday if the schedule works out for me. Two years ago with the release of the Indiana Jones films on blu ray, there were some Raiders IMAX screenings. Today’s presentation was a standard viewing but still worth the time and energy. Disney is doing it’s darndest to exploit all their properties and keep us entertained at the same time. A traditional retelling of “Sleeping Beauty” could have worked fine, just as the live action “101 Dalmatians” did a dozen or so years ago. Somewhere in the bowels of the Imagineering Department or in the Production agreement with big movie stars, someone has decided that a straight remake is not cool, and a story needs to be tweaked to make it fresh. The best known example of this in the recent past has been the musical “Wicked”. A couple of years ago, Disney re-imagined “Alice in Wonderland”. Now it is time for a classic fairy tale to get it’s own variation and they have chosen one with a great villainess which makes the visualization a handy shortcut to the story. There is a great deal to admire about this movie. 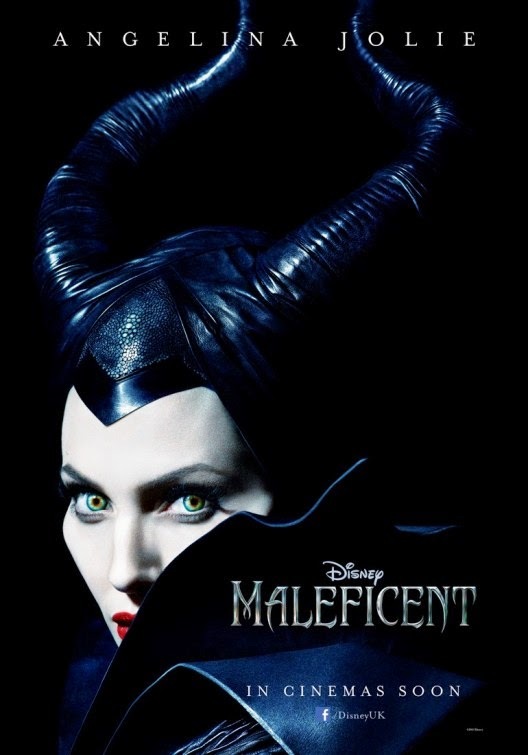 I thought the opening section in which the character of “Maleficent” is introduced in her child form was really marvelous. The character was appealing and there is a nice romantic edge to the story line that is being developed. The character of Stephan however, is not quite as nicely developed and it was hard to see the conflicting choices he was faced with until the key scenes in the movie. The character development here was incomplete which makes some of the plotting a little muddled. Although a conflict between the two worlds was suggested in the narration, we are not really shown any of that except in a direct combat scene. One side is immediately presented as evil and as a result, they lose any interest as part of the story. A whole Kingdom becomes a cardboard cutout villain. The movie shows armies and battles but nothing that would back up the need or desire for those battles. My daughter has watched “Once Upon a Time” and we have both seen “Frozen” so the twist in the movie is not as great as it should be. I liked it pretty well but she feels that it is almost becoming a contemporary cliche. The movie is aggressively unromantic and that trend may reflect blowback from all the years that Disney has been accused of brainwashing little girls about “true love” and the handsome prince. The switch in tone is meant to appeal to more modern audiences and ways of thinking, but it feels like something of the magic is being lost by doing this. The outcome does differ from tradition and while that might sometimes be appealing, it does feel strange when being thrust upon a story like this. In a way it makes the calculation of changing the character focus even more noticeable. Angelina Jolie was obviously perfectly cast in the movie. She almost has the high cheekbones without the prosthetic and special effects makeup. Her eyes do a lot of the acting in the movie but her voice is also used exceptionally well. She is the main reason to see the film. She appears to be invested in telling the story and selling her performance. She has two emotional transformations that she has to pull off and both of them succeed pretty well. The second one is more subtle and takes up much of the storyline but it feels solid because it is allowed to play out. You can see the turn coming, but you can also believe that it might not get here, That is the value of her performance. It is a bit disconcerting that the bad guy has to be the hero and the reverse happens as well. I hope that the desire to tell traditional stories doesn’t require us to subvert what came before every time. I’m willing to go along today because of the casting and performance, but screenwriters should be careful about going to that well too frequently. This may have been a film where the 3D process would be worth seeing. I saw it in a regular two dimensional form and the edges of characters looked soft and artificial to me. I saw several spots where the extra dimensionality would be exciting in the scene, and make the events in those sequences more dynamic. The creatures of the moors that Maleficent is the de-facto queen over look a bit cartoonish and sometimes silly. There are long sequences where the beauty of the woods is supposed to be a marvel but it just looks conventional and weak. The best live comparison I could think of to make was Ridley Scott’s “Legend”. The enchanted forest in that film looked more real on the sets than anything in this CGI wonderland that has been created for the character here to inhabit. You may notice that I’ve said nothing about Sleeping Beauty herself. Elle Fanning is a good actress, she was great in “Super 8” a couple of years ago. She is fine in this film but there is so little to her part that almost any pretty young actress would have been fine in the role. It has to be a thankless task to star in a fairy tale as the princess who is subject to a curse, and end up playing second fiddle to a character that might be mostly defined by her horns. The three good faeries are played strictly for laughs and between them and King Stephan, there is no emotional investment in what goes on with Aurora. There is more to say but it is late and I’ve been busy this weekend as you will see if you visit the other blog. I may come back and add some more to this review but for now i can say it was an interesting experience that I can’t quite warm up to, but did admire at times. I’ve not seen “Ted”, I don’t care for “Family Guy” and I thought his hosting of the Academy Awards was probably not appropriate. That does not mean I don’t think Seth Macfarlane is funny, there are a lot of things about this movie that are amusing. I think that in limited doses and with some strong story telling, he could have made this a classic comedy that will be laughed at by audiences for years. As it is, it feels a little tired about halfway through and it fails to take full advantage of some of it’s assets. Let me start by mentioning a couple of things that worked really well for me, the songs and Charlieze Theron. The title song is actually sung over the end credits and it was funny as heck without descending to some of the sad punchlines the rest of the movie relied on. It was the one element that reminded me of “Blazing Saddles”. The other song in the movie that also worked well was a dance number that did give Neil Patrick Harris the chance to show off some of his talent. It was a reworking of a Steven Foster song, so while not completely original, I know that the lyrics have been juiced up a bit by the screenwriters. Charlieze is the one performer who seems to be trying to play a character in a story. Everyone else is mostly mugging for the camera, she plays sweet, and tough and winsome all at once. Even when she is doing comedy shtick, she still seems like a real person. Maybe not always an 1882 person, but not just a joke on two legs. MacFarlane, Giovanni Ribisi, Sarah Silverman, and even Liam Neeson, are camping it up for the camera. Silverman especially, because her part is the broadest and most risque, plays it like a live action cartoon character. After getting the great dance scene, Harris is subjected to a remake of a scene from “Dumb and Dumber” and “Bridesmaids” and it feels tired and the visual punch is for shock value only. 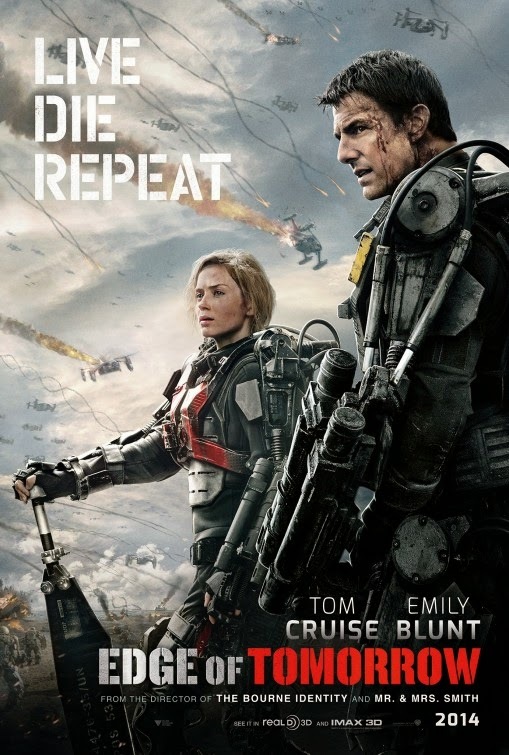 Part of the problem is too much of the premise is given away in the title and the trailers. We are constantly on the lookout and waiting for the next horrifying thing to happen. Instead of being surprised, we are anticipating and the lack of payoff can probably be lain at the feet of the marketing department. Rapid jokes and punchlines are fine, I loved “Airplane!” and it’s successors. Here it was just more redundant than it needed to be. I think a lot of the humor relies on being politically incorrect, but that is as far as it goes. When Mel Brooks or Richard Pryor made a joke about race or religion, it was in aid of a bigger laugh, it was not the laugh itself. So much of what MacFarlane does just feels like poking the bear for the sake of getting a rise out of him. I enjoyed seeing several cameo appearances in the movie, but I also liked seeing several familiar actors from television and movies show up in smaller parts. Matt Clark has been making movies since the 1960s and he has a nice part as a grizzled prospector in this film. He has appeared in several Clint Eastwood Westerns, at least one John Wayne film and several TV westerns. The movie needed a few more references to those roots rather than just the contemporary stunt casting used for quick visual jokes. This movie was entertaining but not special enough to make it essential repeat viewing. 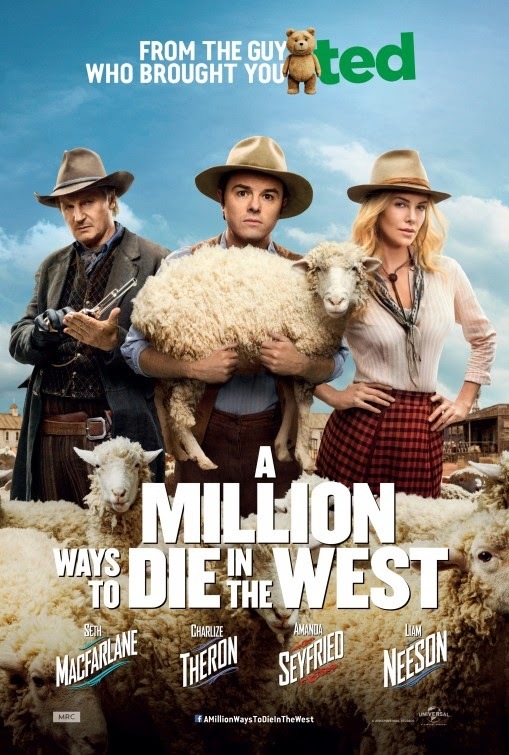 I don’t know that there are in fact a million ways to die in the west, but I do know that there are a million ways to make a potty joke, and this movie uses about half of them.